It recently went through a thorough process of rejuvenation and all is in working order. Engine was recently rebuilt, also fitted with a small performance camshaft, the original Turbo 400 Automatic transmission was also rebuilt and receipts are available, brakes function as they should, vacuum operated headlights and wiper door are functional as they should, a new gas tank and fuel system was installed. AC is complete, holds pressure, but will need to be recharged. The only items needing attention are the clock and the tachometer which are not functional. Note the "matching numbers": correct VIN and suffix on engine, also date and casting. It came from the factory Sunfire Yellow, code 412, but now it is dressed in Black. Body has great integrity with the exception of small crack on the rear to the left of the license plate as seen in the pictures done while backing into an object in the garage. Paint is fair with its share of bubbles and imperfections. Interior is Saddle and appears it was recently redone. Power windows and all gauges and instruments work, except as mentioned above. Car runs and drives very civilized and has great road manners. Engine starts right away, no smoke, no hesitations...transmission shifts as it should, brakes work, wipers work, headlights work. 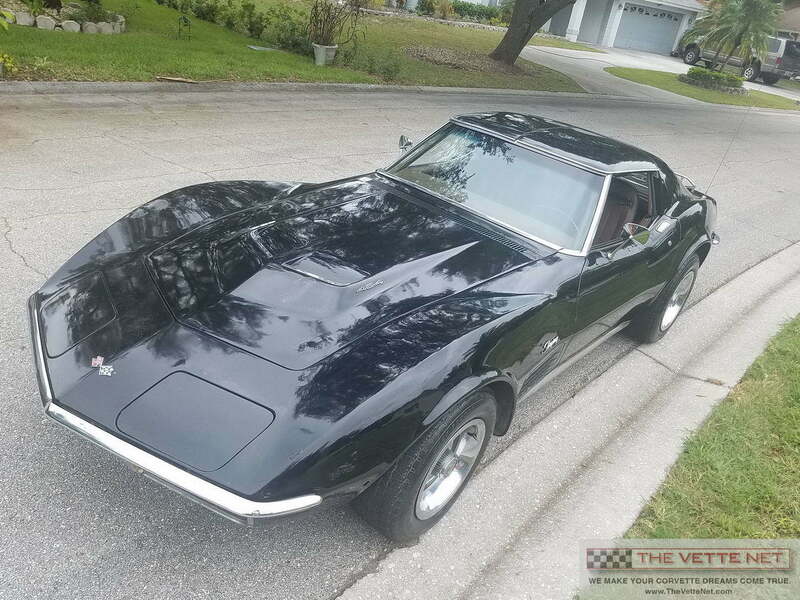 This is a complete Corvette, priced right, which will allow you to gradually improve and add as you go. With a little here and there, you will be very proud to drive around and show this great piece of Americana!